Flying formation in a WWII vintage aircraft was one of the highlights of my flying experiences. It had taken years of education and practice to sit confidently in the ‘driver’s seat ‘ behind the 550 hp engine and to gain admission into the ‘elite’ group of warbird pilots. During my training, one of the most vital bits of technical knowledge I learned was a critical engine handling technique that was more like a sacred commandment than a rule. A great deal of vigilance was needed to prevent undue stress to the engine. So, any time the power settings changed during a flight (take-off, climb, leveling out, changing forward speed on landing) it was necessary to ensure that the rotation speed of the propeller was always faster than the power setting for the engine. If the pressure from the engine’s combustion process was not dissipated in a timely fashion through increasing the rate of rotation of the propeller, the build-up of internal pressure could cause irreparable damage to the engine by over-boosting it –something to be avoided at all costs. One always took care to make sure the prop rpm’s accommodated the engine’s power settings for the ultimate peace, performance and longevity of the aircraft’s power source. Flying and learning to fly had its moments and just like the process I used to keep the engine properly handled and in good operating condition, I had to learn healthy ways to dissipate my own build up of internal energy (better known as anxiety) ! I discovered early in the game that if I didn’t deal with the butterflies of anticipation and nervousness that often preceded a big flying event, not only was I defocused and jittery but I also could not enjoy the exquisite experience in which I was participating. Formation flying was a dance in the sky choreographed with a mere silent signal from the lead aircraft…everyone in the flight knew what to do, when to do it and how to work together as a single flow of aircraft across the sky …it was both an impressive sight from the ground and an equally powerful expression of skill, synergy and grace in the air. In order to fully engage this experience, I needed to be focused yet calm; confident of my knowledge and aware of my surroundings. Anxiety or stress is often maligned as a destructive force that needs to be eliminated from your life if you are to achieve any semblance of peace. But, in measured amounts, it was the very energy that got me to sit up, pay attention and stay alert in my flying experiences. It was my controlled anxiety that pumped just the right amount of cortisol into my system to keep me ‘edged up’. When I was able to find ways to calm my own inner butterflies and get them flying in formation within me, I was then able to use their forward propulsion in much the same way that the engine’s power and propeller drove the aircraft forward in perfect harmony. Someone once said that fear and excitement are two sides of the same coin. I discovered that the trick is to balance between the two and lean a little more into the excitement! It is where you find the ‘sweet spot’ that provides both peak performance and unbridled satisfaction and joy. What stress creating life event might you be immersed in right now? Maybe it is an upcoming interview for a job you really want or you are anticipating stepping onstage to deliver an important speech. Perhaps you are writing your first article for a magazine or maybe you are taking final exams toward your degree. Could it be that there are daily events that create stress and anxiety for you – at work? with your friends? with your family? Are you pulling up stakes in your life and stepping into a big move? Take a moment to consider and bring awareness to the anxiety in your life and think about how its presence helps or hinders your forward motion and your inner health and happiness. Is it stopping your growth…or obscuring the positivity and fun of the in the next steps of your development? How much more elegant could the experiences of your life be if you could manage your anxiety not through getting rid of all of it but by channeling it for optimum personal energy? Locate where you feel it in your body – is your stomach in a knot or churning? is your heart pounding? your head about to explode with panicky thoughts? Take note of how big it feels? Rate its intensity from 1 to 10 (10 being highest level). Focus on the area you just identified – take a few slow, deep breaths to help you relax. The breath is the calming elixir that is easy to use anywhere, anytime. Take a few quiet moments to imagine yourself having a loving conversation with that part of you as if you were talking to a friend or child who is kicking up a fear storm. Ask such questions as – what are you anxious about? what do you think will happen? Is this a real threat or just a fear about a possibility? what about this experience caused you to get upset? what do you need to help you? Give yourself 5 minutes to hear all the concerns. Write down the most significant words or short sentences that arise from this conversation. Maybe you hear – “This is bigger than me”… “I cannot do this”…”I want to quit now and run away” …”This is just too scary, way too scary!” “What if I fail?” include any other ‘what if’s’ that might come to mind. The idea here is for you to assume the role of a parent/adviser who can provide a listening heart and support. Just as the propeller setting in the opening story is the way that engine energy is put to work, this step takes your anxiety and directs it into forward motion too. Using the fingertips of one hand, gently tap on the anxiety-holding areas of your body that you identified in the first step. As you tap, speak out loud, the short sentence and some of the words of your anxiety that you recorded in the second step. Just this simple action of tapping can release the damaging aspects of overwhelm or fear. Continue this tapping and talking until you feel a shift in the level of anxiety (usually this takes only a couple of minutes). As soon as you notice the level of stress diminish below what you measured in step one, it is time to redirect the remaining anxiety toward forward momentum. Keep tapping now as you turn the sentence and the words into positive statements. For example, if you were saying ‘I can’t do this. It is too big. It is too scary’, you might now want to say something like ‘ This is more than possible’ ‘I am bigger than this issue and it no longer scares me’ ‘ This anxiety is my fuel and I choose to use it to succeed with ease and grace’. Tap and talk using whatever positive statement comes to mind (this is an organic process so let your intuition lead the way here) until you notice a feeling of energized relaxation … take a deep breath in and slowly exhale. Now reassess your level of anxiety and notice what has changed in your body as well as your desire to proceed beyond that anxiety that previously held you back. Armed with these easy steps, the quiet authority of your finely tuned anxiety will keep you connected to your life, feeling more alive and confident to choose the next progressive step forward in your life. 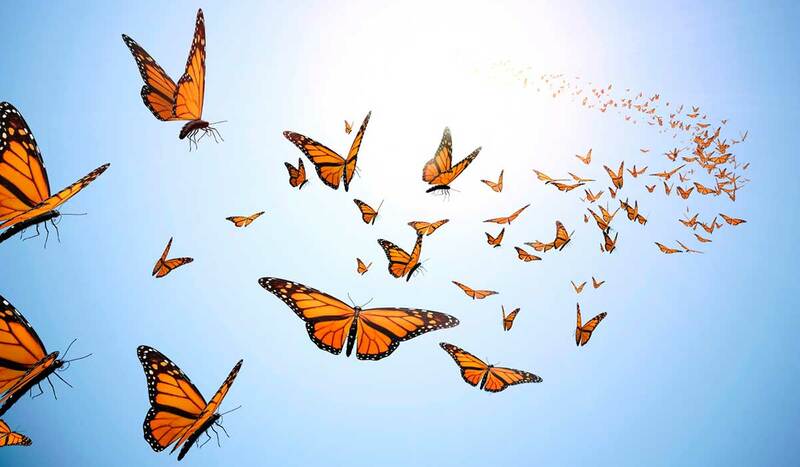 When you develop the capability to lead the formation flight of your butterflies, you translate your anxiety into enthusiasm and rather than be damaged by the scattered power within you, you move with ease and purpose toward change and transformation in your life. Thanks for a very solid and informative post, Timothy. I especially enjoyed the analogy to flying. Sometimes I personally get a burst of anxiety which could lead to panic when I’m driving at night, especially on the high-way. The breathing exercise helps me. Giving your anxiety a voice and listen to it makes total sense. I probably would have to watch out not to go into hypochondriac-mode, which would accelerate anxiety, but staying calm and watching / listening to what my anxiety wants to tell. I’m looking forward to trying your tapping technique! Thanks again, Timothy.